Princeton University Press, 9780691175621, 408pp. Until a few decades ago, the ocean depths were almost as mysterious and inaccessible as outer space. Oceans cover two-thirds of the earth's surface with an average depth of more than two miles--yet humans had never ventured more than a few hundred feet below the waves. 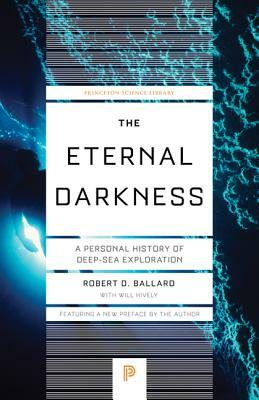 One of the great scientific and archaeological feats of our time has been finally to cast light on the "eternal darkness" of the deep sea. This is the story of that achievement, told by the man who has done more than any other to make it possible: Robert Ballard. Ballard discovered the wreck of the Titanic. He led the teams that discovered hydrothermal vents and "black smokers"--cracks in the ocean floor where springs of superheated water support some of the strangest life-forms on the planet. He was a diver on the team that explored the mid-Atlantic ridge for the first time, confirming the theory of plate tectonics. Today, using a nuclear submarine from the U.S. Navy, he's exploring the ancient trade routes of the Mediterranean and the Black Sea for the remains of historic vessels and their cargo. In this book, he combines science, history, spectacular illustrations, and first-hand stories from his own expeditions in a uniquely personal account of how twentieth-century explorers have pushed back the frontiers of technology to take us into the midst of a world we could once only guess at. Ballard begins in 1930 with William Beebe and Otis Barton, pioneers of the ocean depths who made the world's first deep-sea dives in a cramped steel sphere. He introduces us to Auguste and Jacques Piccard, whose "Bathyscaph"descended in 1960 to the lowest point on the ocean floor. He reviews the celebrated advances made by Jacques Cousteau. He describes his own major discoveries--from sea-floor spreading to black smokers--as well as his technical breakthroughs, including the development of remote-operated underwater vehicles and the revolutionary search techniques that led to the discovery and exploration of the Titanic, the Nazi battleship Bismarck, ancient trading vessels, and other great ships. Readers will come away with a richer understanding of history, earth science, biology, and marine technology--and a new appreciation for the remarkable men and women who have explored some of the most remote and fascinating places on the planet. Robert D. Ballard, PhD, is President of Ocean Exploration Trust, director of the Center for Ocean Exploration, professor of oceanography at the Graduate School of Oceanography at the University of Rhode Island, Graduate School of Oceanography and the author of several bestselling books.